Striped Wandering Jew is a succulent-stemmed plant that creeps and sprawls and trails all over itself to make a dense groundcover. Leaves are 7.6 cm oval, pointed, that clasp the stem alternately, and have hairy upper surfaces with a silky iridescent sheen. They are an intense violet on the underside and striped with pale silvery turquoise and dark burgundy-tinged green on top. The round stems are a watery seafoam green with burgundy spots and blotches. The flowers are borne in small clusters at branch ends, and are subtended by two leafy bracts. 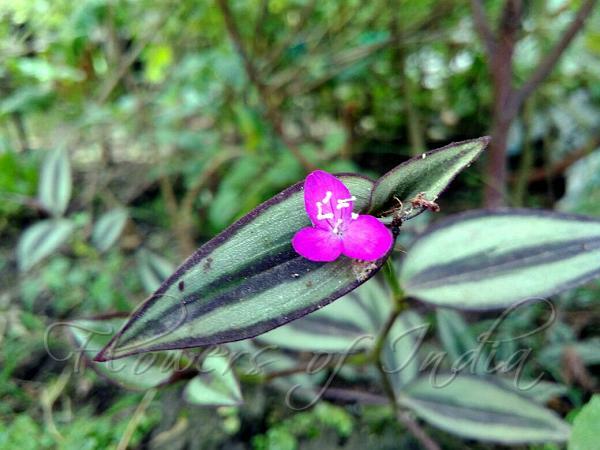 They have three bright pink or purple-magenta petals 1.0-1.2 cm long, that are fused at the base into a whitish tube 5-9 mm long with three rounded spreading lobes, about 6 mm long. Flowers also have three smaller sepals and three stamens bearded with purplish hairs. Flowering occurs mainly in spring and summer. 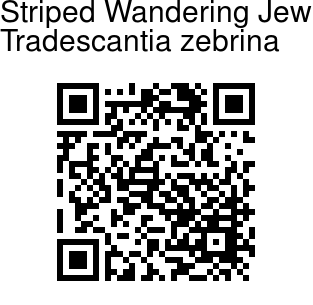 Striped Wandering Jew is native to Mexico, Central America and Colombia, and naturalized in parts of Asia, Africa, Australia, South America, and various oceanic islands.